This red beef chili recipe (aka Sahara Chili) won the CASI Terilingua International Chili championship in 2005 & 2009. 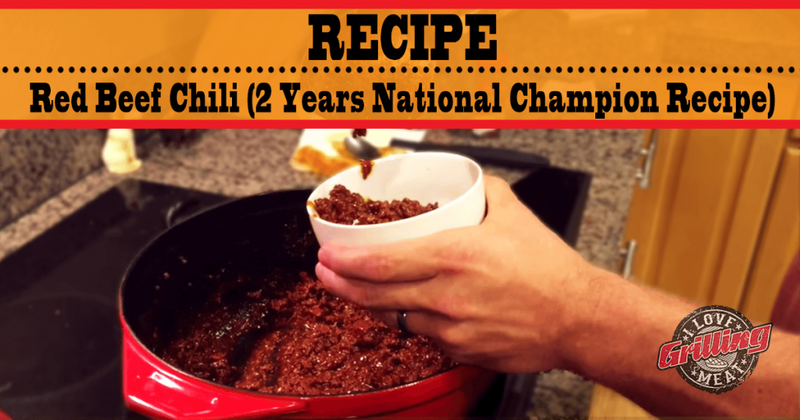 If you’re looking to step up your chili game, this recipe is for you! Heat up a pan, and start adding the ingredients. First: add 2 lbs. coarse ground beef, 1 tbsp cooking oil and 1 tbsp granulated onion. Mix the ingredients and lightly brown the meat. Next, add 1 can (8oz) tomato sauce and 1 can (15oz) beef broth. Cook for 30 minutes. After 30 minutes, add 1 tbsp light chili powder, 2 tbsp dark chili powder, 1 tsp garlic powder, 1/2 tsp salt, 1/2 tbsp cumin, 1/2 tsp cayenne, 1/2 tsp black pepper and 1 tsp chicken granules (or 1 cube). Finally, add 1 tbsp light chili powder, 1 tbsp dark chili powder, 1 tsp paprika and 1/2 tbsp cumin. Add water if needed. If you want a less salty result, you could use 8 oz of beef broth earlier in the second step, and water at the end. Leave covered and simmer for 30 minutes. What are the amounts for the Chili recipe?